Months of planning have enabled a weekend operation to install two 1,000t bridges on England's A14 highway to be completed 18 hours ahead of schedule. The bridges were installed at Bar Hill as part of the US$2 billion A14 Cambridge to Huntingdon upgrade. The project is being carried out by a three-way joint venture of Balfour Beatty, Skanska and Costain. A total of 12 girders were fabricated at Cleveland Bridge UK's facility in Darlington before being transported by road to the site, where the reinforced concrete decks were added. The A14 was closed at 9pm on Friday 14 September and wasn’t due to open until 6am on Monday, but traffic was allowed back at midday on Sunday. 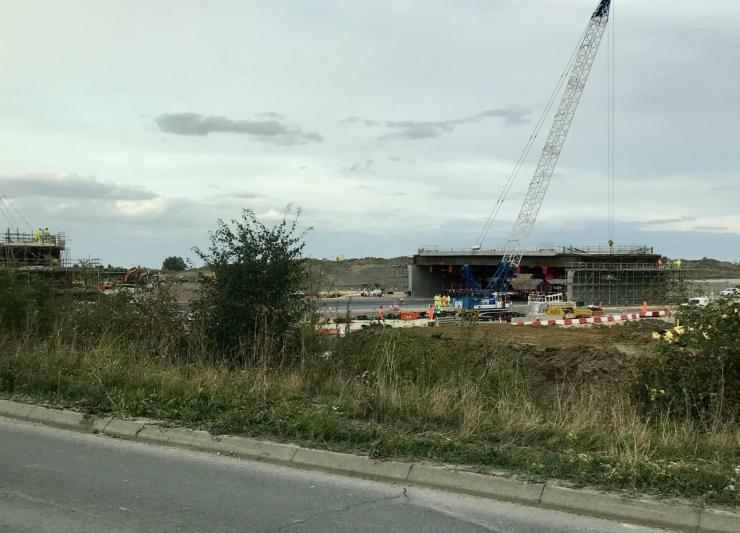 “The work has been long in the planning and I’m pleased to say went ahead smoothly,” said Highways England’s construction director for the project Julian Lamb. 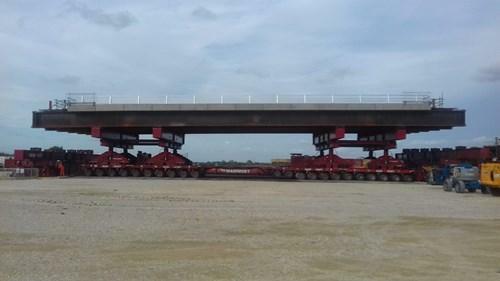 The two 44m-long bridge decks had been built at the side of the carriageway, ready for each to be wheeled into place and raised onto its abutments using a self-propelled modular transporter (SPMT) operated by Mammoet. The new bridges will replace the existing one at Bar Hill, which will be demolished next year.